As you know by now, I have a series of pamphlets and books to give away this month, courtesy of Lark Publishing! Each of the pamphlets has 19 or 20 projects by a variety of artists, most but not all of them fairly easy and quick. 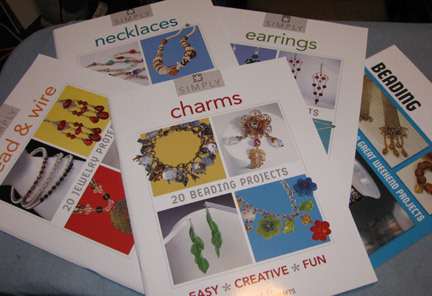 The next one up for grabs is Simply Earrings , a pamphlet containing 19 projects that were previously published in Beading with Crystals and in Beading with Gemstones. This volume covers basic wire skills like working with a jig, making a shepherd's hook, and more complicated wire wrapping and chain techniques. Please make sure that your link will lead me to an email address, or else I won't be able to contact you. No contact, no win, and I simply have to go on to the next person. Deadline: September 22, 2011. Cool - I was just thinking I needed to make another batch of earrings. They're like socks - I always manage to lose one half of a pair. I love earrings and am always looking for new ideas for earrings. I'd love a chance to win this book. Thanks. Just tweeted about your giveaway. Thanks. I love making earrings, so I would love this book. I'm addicted to earrings and wear them all the time. Would love to try out some of these designs. Just in time for fall & holiday gifts! LOVE love love to make and wear earrings! This book sounds divine to me! Added the link about the giveaway to my Facebook page! Love earrings, new ideas, and free ! I love making earrings since they are quick and easy. Would love a chance to win this book! Thanks for the giveaway! Love,LOve,loVE, free stUff! I'M sure I nEEd to WIN,WIN,WIN!!! I love making earrings. Sounds like a great giveaway.